On each port is a tooltip which displays the source of in-ports and the destination(s) of the out-ports. ‣ Hover your cursor over a port. You can navigate to the parent or child module of the selected module or selected cable in the Network. ‣ In the Network view, select a module or cable, and press [Ctrl] + [Up]/[Down] arrows. 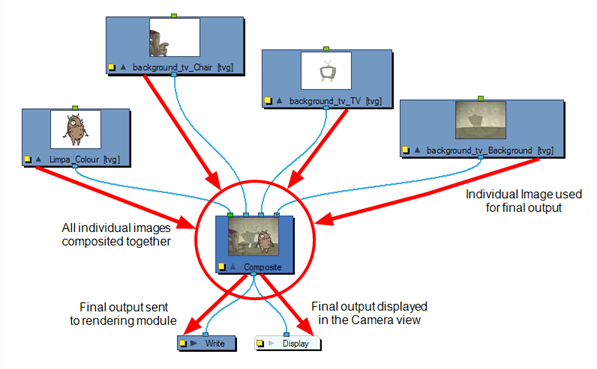 The Composite module allows you to use several images and output a single image. You can compare that to doing pre-compositions in editing software. 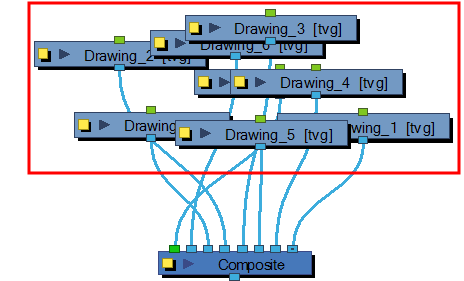 You connect several drawing modules in your Composite module and one bitmap comes out of it. 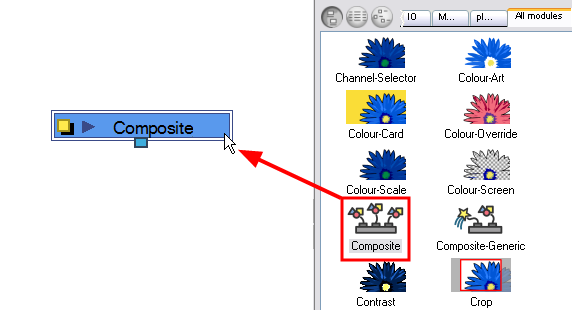 By default, the image resulting from the Composite module is a bitmap. The layers are composited together depending on their position on the Z-axis (forward-backward) first, then their order in the Composite module. 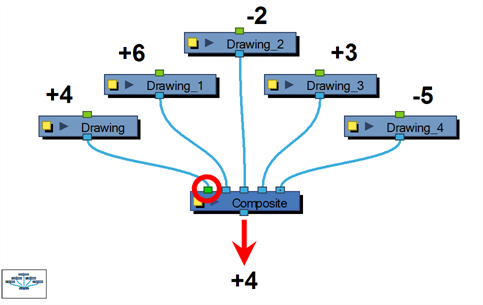 If two images are at the same position on the Z-axis, their order in the Composite will determine which one is displayed in front and which one is displayed behind. You can customize the look of the cables in the Network view to fit your style of working. 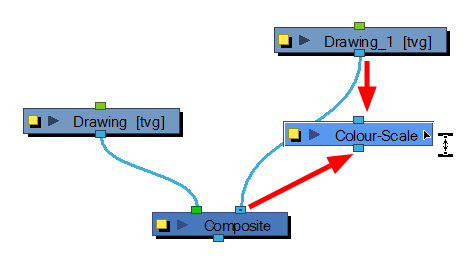 You can display the cable lines as Bezier (curved) lines or straight lines. 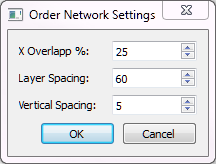 ‣ In the Network View menu, select View > Cable Style > Bezier or Line. 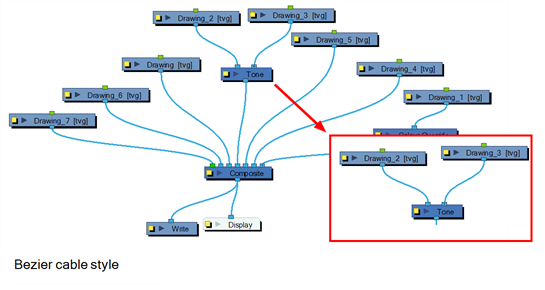 Refer to Scene Setup Preferences to learn how to set the cable style in the Preferences dialog box. The Navigator is a small square window inside the Network view that displays a bird's eye view of the network. The view displayed in the Network view is shown framed in the Navigator display. You can drag this frame to pan the current Network view display. You can show or hide the Navigator from the Network view. ‣ In the Network View menu, select View > Navigator > Hide Navigator or Show Navigator. ‣ Press [Ctrl] + [Shift] + [W] (Windows/Linux) or [⌘] + [Shift] + [W] (Mac OS X). The Navigator display can be placed in any corner of the Network view. ‣ In the Network View menu, select View > Navigator > and select Top Left, Top Right, Bottom Left, or Bottom Right. 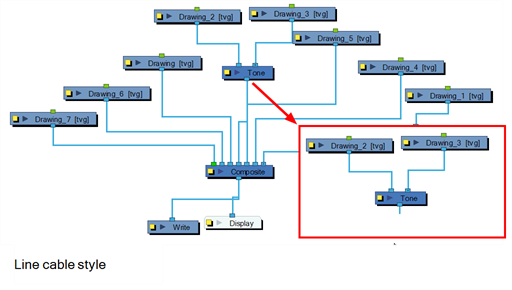 Refer to Scene Setup Preferences to learn how to set the Navigator display options in the Preferences dialog box. The magnifier helps you view the entire network so you can navigate and view the different modules. A black outline surrounds the area you were at before pressing [Z]. 2. Change the magnification level of the magnifier by rolling the mouse wheel. When the magnifier is displayed, it is possible to temporarily switch in and out of the magnified view by clicking in the magnifier. 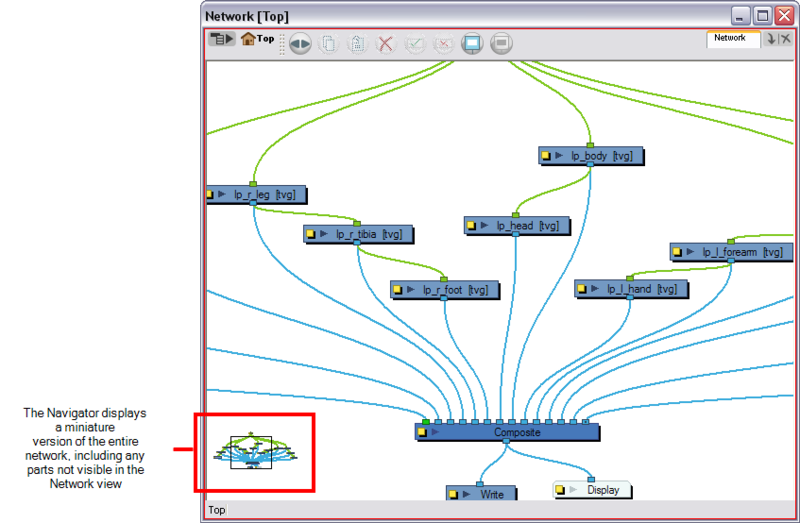 Once you have selected a node, you can pan the Network view to navigate around when your network grows more complex. 1. 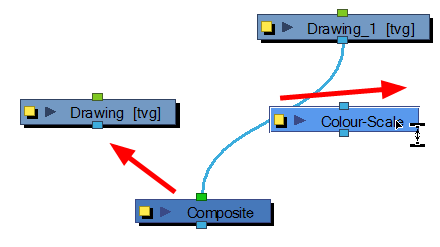 Select a node, press [Spacebar] and drag to a new location.